Ultralight and lightning quick. 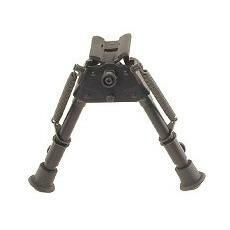 The bipod attaches to the sling swivel by a screw-up clamp. Manufactured from heat treated and hardened alloys. Series S bipods rotate to either side for instant levelling on uneven ground. Lowest of the Bipods. Designed for shooting off the bench. Height adjustable from 6-9 inches. Its a rest for my rifle. It has two legs one might describe it as bipedal. 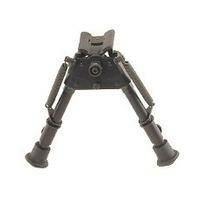 The legs are somewhat pod like bipod seem an appropriate term. Its well built it works. I like it. Super piece of kit, got one on my BSA Martini Mk III along with a number 6 adapter. I wouldn't even try to compete in a competition without it. As Tony the Tiger says - it's great!